New Deli Crumb Cake for sale. Buy online at Zingerman's Mail Order. Gourmet Gifts. Food Gifts. 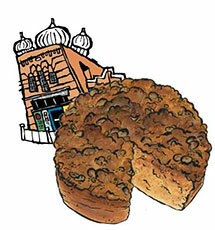 The latest coffee cake from Zingerman's Bakehouse. It's not every day the pastry chefs at Zingerman's Bakehouse introduce a new coffee cake to the world. That's why it was such a big deal when we introduced the New Deli Crumb Cake! Its size, shape and topping are akin to our Blueberry Buckle: moist crumb made with organic flour, lots of sweet butter and topped with a butter-crumble crust. The flavor is far from American. For inspiration, we took our cues from the Indian subcontinent and devised a recipe that's imbued with the exotic flavors and aromas of India: pistachio, cardamom, ginger, clove and even a little coconut. The result is a crumbly, sweet, exotic and slightly spicy coffeecake to make your mornings more interesting. Let your tastebuds travel without ever leaving home!